THE ONLY SECRET BRIDAL FAIR IN DOCKLANDS! 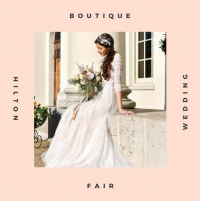 The creative and imaginative team at Elite known for staging a spellbinding series of Chelsea shows including the magnificently popular Enchanting Wedding Fair and the exclusive Secret Wedding Show will be bringing our magical fairy dust to the brides of Docklands London. The theme of the show revolves around exclusivity and luxury atop secret wedding show like no other by blending the elegance of a select group of exhibitors to dazzle and wow our brides. So come along, indulge in a glass of bubbly, meet London’s finest suppliers, watch our bridal catwalk show, & take home a goody bag full with exclusive offers & products. Just don’t leave the Groom at home… Hilton Riverside secret wedding fair! Get in touch now to join us on the day. Mission? Accepted. From Canary Wharf station it’s just a few minutes to Canary Wharf Pier where all brides and entourage will be able to take a 2min free boat ride directly to the entrance of the hotel. Just quote: (Hilton’s Atlantis Bride) before boarding the ferry.